Every day, SAP asks their customers to re-imagine their business, push the boundaries, or enhance the customer experience. Today, it’s about the digital transformation of SAP. Currently ~80% of SAP customers don’t have a Customer Engagement Executive, and it’s difficult for them to make smaller purchases. This is especially true for small and midsize wholesale distribution customers. SAP has a significant opportunity to improve their relationship with SAP via digital channels. SAP Digital, is designing, orchestrating and running a simple and consistent so-called “No-touch” experience for customers and partners. This means product, service and support offerings without involvement of the SAP sales force, powered by SAP C/4HANA and the new customer experience, SAP CX. Customers and partners may discover and buy online anywhere, anytime, in a few clicks with clear product descriptions for SAP and trusted third-party solutions in the environment of SAP.com, SAP AppCenter, Amazon, Alibaba, and more. More and more software product pages will integrate relevant information with a “try-and-buy” experience. Customers and partners will find all information, from software capabilities, through customer references, to pricing & plans, extensibility and ecosystem, support, and training on the product pages. The checkout for the “Buy now” option contains a guided configuration and purchase in a simple, integrated checkout. Related offerings, such as extensions and apps, are promoted in the context of the core SAP product. SAP SuccessFactors Recruiting, Performance & Goals, and Succession & Development available digitally at successfactors.com & SAPStore.com. Partner extensions available on the SAPAppCenter (over 160 available now). 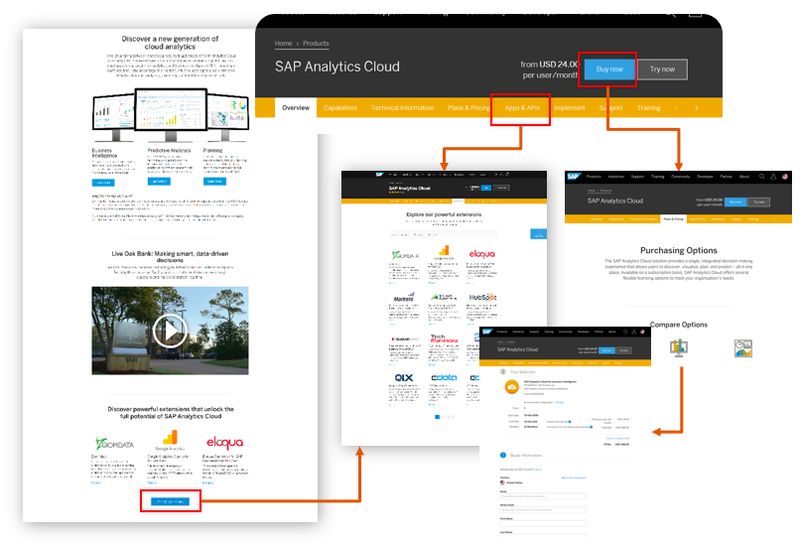 Analytics solutions available digitally, starting with SAP Analytics Cloud for BI; SAP Analytics Cloud for planning, standard and pro editions; SAP Digital Boardroom; and SAP Analytics Hub. Partner offerings, available at SAPAppCenter – that complement and extend SAP Analytics solutions. At the SAPAppCenter, customers have 24/7 global, real-time access to innovative solutions, microservices and plugins to extend their SAP solutions and digitally transform their business. They can discover, try and buy ~1,500 enterprise-class apps from 1,000+ trusted partners at the SAPAppCenter. With a mix of free and paid apps, organized into categories and industry solutions, the SAPAppCenter has a solution for you regardless of which SAP technology you use. Even though software products and services incorporate a higher complexity than many other products, SAP wants to set industry standards for customer-centricity and simplicity in doing business.